Venezuelan migrants wait at the Binational Border Service Center of Peru, on the border with Ecuador, in Tumbes, Peru, Aug. 25, 2018. During his two-week trek through the bitterly cold Andean mountains, penniless Venezuelan migrant Jesus Mendoza has eaten better than he has for months in his impoverished homeland. "In Venezuela, I'd eat two meals a day if I was lucky," said Mendoza, walking along the Pan-American highway with a tattered backpack. He illegally crossed an unguarded border into Ecuador from Colombia. "Along the way, Colombians have been generous. They have given us food and water," the 25-year-old carpenter told Reuters. "I've even been eating chicken, which is a luxury back home." An economic meltdown, growing poverty and medical shortages have forced more than 1.6 million Venezuelans to abandon the oil-rich nation since 2015, one of the largest mass migrations in Latin American history, the United Nations says. Venezuela's rich, skilled and university-educated left to find oil jobs and set up businesses abroad years ago. 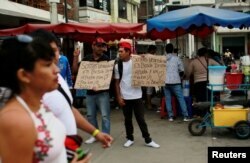 Venezuelan migrants hold signs that read "We are Venezuelans looking for help and a job, God bless you" at the border with Ecuador, in Tumbes, Peru, Aug. 24, 2018. Today's wave of migrants are Venezuela's poor and most desperate. Without money for airfare, bus tickets or even a passport, thousands, some carrying babies in their arms, are on foot, walking to find what they hope are better lives in Ecuador, Peru, Chile, Brazil and Argentina. Karina Mendez, 38, and her husband left Venezuela two weeks ago for Peru, where they hope to earn money for antibiotics and other medicine for their sick young daughter. "When you can actually find the medicine you need, it's too expensive to buy," Mendez told Reuters, as they waited hours to hitch a ride with truck drivers. With rampant hyperinflation — the International Monetary Fund forecasts Venezuela's inflation could reach 1 million percent by year's end — the monthly minimum wage barely covers the cost of a kilo of rice or flour. Money has become so worthless that bills are used to make trinkets and souvenirs. "With what you earn in a month, you can't even afford to buy the basic things you need to survive. Food prices can rise 40 percent overnight," said Rafael Barboza, another migrant walking along the windy highway. Colombia has taken in the highest number of Venezuelans, about 870,000, and growing numbers are spreading across South America. A Venezuelan migrant prepares food as another rests at a temporary shelter in Tumbes, Peru, Aug. 25, 2018. More than 4,000 Venezuelans poured into Ecuador every day during a record peak in mid-August. Officials from Colombia, Ecuador and Peru are meeting in Bogota this week to seek a solution to the migration issue, which threatens to overwhelm the region. The U.N.'s International Organization for Migration said last week a "crisis moment" is building, comparable to the refugee crisis in the Mediterranean. "We need a regional response plan," said Christian Visnes, country director in Colombia for the Norwegian Refugee Council. "As the exodus grows in scale and breadth, any unilateral action will have numerous consequences for other nations in the region." Peru this month tightened entry rules for Venezuelans, requiring passports instead of just national identity cards. A judge in Ecuador has postponed a similar rule for six weeks. "These type of measures will not stop people from crossing borders. They will keep doing it," Visnes said. Yolanda Montenegro, who runs a private migrant shelter called Casa Hogar Jesus del Migrante in the Ecuadorian border town of Tulcan, said controls will fuel the numbers crossing illegally. "Behind every migrant is a family waiting to be fed. It's only logical that people will carry on regardless of any restrictions placed," Montenegro said. "Those benefiting are the human smugglers who use the desperation of people to gain profit." More and more migrants have their hearts set on Peru, one of the fastest-growing economies in the region. A Venezuelan migrant sells candy at a street in Tumbes, Peru, Aug. 25, 2018. Some 350,000 Venezuelans have settled in Peru this year, up from 2,350 in 2015. Peru is seen as having fewer work visa restrictions and offering the best chance of jobs as builders, cleaners, waiters and farm laborers. "I've heard Peru has a good economy. My son found construction work there within weeks," said 52-year-old Daniel Segura, a migrant and lorry driver, who hopes to join his son. Migrants are also drawn to Ecuador where they can earn in U.S. dollars. It has become home to about 40,000 Venezuelans. Many have made a new home in picturesque Ibarra, a two-hour drive from Ecuador's mountainous border with Colombia, washing car windscreens at traffic lights, peddling sweets or working as cheap labor for local businesses. Angel Mejia, 35, who came to Ibarra in March, works as a hotel cleaner and get tips from guarding parked cars at night. The former supermarket manager earns less than half the nation's monthly legal minimum wage. "I'm just grateful to have work that allows me to send $40 a month to my wife and baby in Venezuela for their basic survival," he said. On the highway heading to Peru, 21-year-old Javier Caballero dragged a wheeled suitcase stuffed with blankets and a large cross, unfazed by measures to deter migrants. "We're not afraid of anything anymore. We'll keep going. We've seen catastrophic things in Venezuela, people dying of hunger," said Caballero. "We have no passports but returning to Venezuela isn't an option," he said. "It would be going back to misery."